Scoop.it is a free and user friendly content curation service that allows users to collect information about a topic of interest and display it as an attractive visual magazine. The handy bookmarklet allows users to add content to a magazine with the click of a button while browsing the web. Users can follow others with similar interests and rescoop posts from one person’s magazine to their own. Scoop.it also generates suggestions that match your interest. This is an efficient way to share content. I recently started a new Scoop.it collection dedicated to the topic of 21st Century Research and Information Fluency. Below you will find an embedded preview of the magazine. Click the link below the preview to visit the actual magazine. 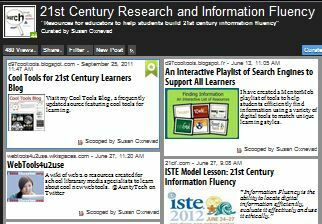 View 21st Century Research on Scoop.it!